Every day, women and girls around the world spend more than 150 million hours collecting water. 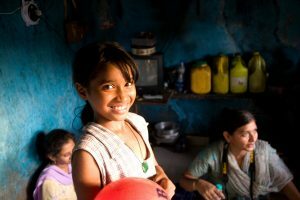 If that number isn’t enough to shock you, consider this: the disproportionate burden that women and girls bear for water, sanitation, and hygiene (WASH)-related responsibilities results in missed educational opportunities, the inability to earn an income and even results in poor health outcomes for women and girls around the world. Today, on World Water Day, ICRW is proud to be working on the Women + Water Alliance, a recent partnership between Gap Inc. and the U.S. Agency for International Development (USAID). The Alliance will start in India, with additional countries to be determined. The goal is to advance the health and well-being of women touched by the apparel industry by improving access to clean water and sanitation services. The approach will include: 1) activating women in communities with the technical and life skills to advance in their homes, workplaces, and communities by expanding the Gap Inc. Personal Advancement & Career Enhancement (P.A.C.E.) program; 2) accelerating women’s access to sustainable water, sanitation, and hygiene (WASH) services by supporting access to finance and the broader enabling environment; and to 3) aggregating civil, government and private sector stakeholders to improve the management of shared water resources. From ICRW’s previous research, we know that the P.A.C.E. program, originally designed to empower female garment workers, is effective. Through ICRW’s evaluation of six factory sites where P.A.C.E. was implemented, we concluded that the program is an effective, sustainable and scalable model that yields high returns for women, their families and the businesses where they work. This Women + Water Alliance program will use the lessons learned from P.A.C.E. to increase knowledge and self-efficacy of women, specifically surrounding WASH-related topics. Addressing access to public hygiene information and water and sanitation facilities creates opportunities to strengthen women’s lives, and in the process, to improve health and safety outcomes for their families. This is not the first time Gap Inc. has introduced WASH education into the program curriculum. In 2015, P.A.C.E. began providing life skills training and water- and hygiene-focused education. In providing this resource in dozens of factories across Asia, Gap Inc. recognized that the behavior change communication would be most effective when coupled with access to services such as WASH and finance. Indeed, research has shown that WASH financing initiatives consistently provide a valuable return on investment – both financially and in societal benefits. Women are far more likely than men to invest their income in products that benefit their families. Furthermore, WASH loans, which are overwhelmingly taken out by women (more than 95 percent) also lead industry repayment rates (more than 99 percent). Over the course of five years, the P.A.C.E. program and the Women + Water Alliance will reach hundreds of thousands of women. In order to effectively manage programming feedback, CARE India will utilize the established evaluation approach for P.A.C.E as designed by ICRW. CARE India will also build the capacities of select P.A.C.E. alumni to function as “WASH Champions,” who will assume leadership roles to mobilize other women and stakeholders to achieve water and hygiene specific objectives, empowering program participants to access their WASH-related social entitlements and advocating for their rights in the workplace. Life skills and lessons learned through the P.A.C.E. program can have ripple effects through an individual’s family and community. Similarly, proper water and hygiene protocol can save the lives of the families and children of P.A.C.E. participants. When women feel empowered to speak up for their rights and capable enough to find appropriate educational and financial resources, communities become stronger, healthier and more profitable.